Pro Match Soccer Ball designed for use in competitive matches. Double layered outer skin and interlaced bladder ensures consistent shape and inflation for years to come. Make no compromise on quality when selecting your matchday ball. Give each match the feel of a cup final by choosing the pinnacle of soccer balls. Designed with Hybrid-Fusion technology, your star strikers will score like never before thanks to the dual bonded design of the soccer ball. Manufactured to pro specifications, the match ball has 12 panels, each with specially developed grooves which enhance shape retention and aero-dynamism. As you take to the pitch with a crucial three points at stake you need a quality matchday soccer ball that you can rely on as much as your team mates. 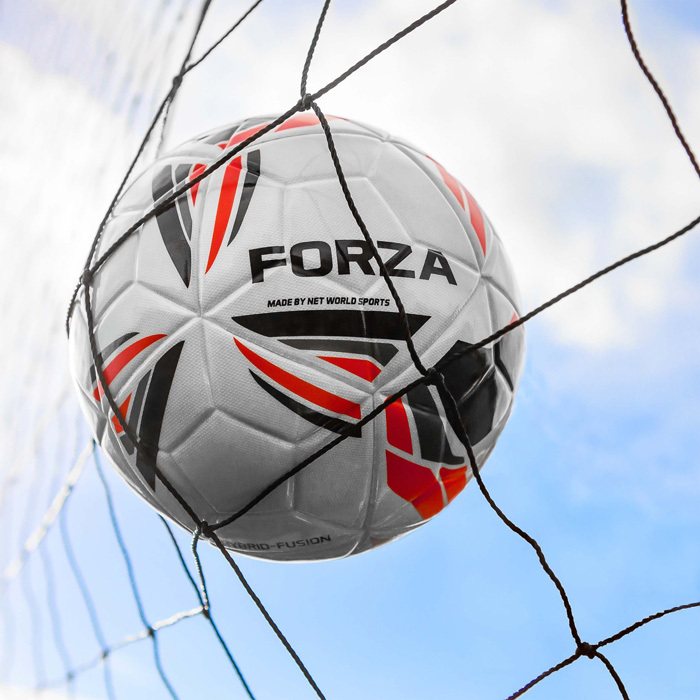 Manufactured with Hybrid-Fusion technology, the FORZA Pro Match Soccer Ball is as robust and powerful as a tough number 9, while maintaining the style and panache of a dainty winger. Designed to FIFA Quality Pro specifications, this professional soccer ball is worthy of gracing stadiums the world over. With innovatively designed grooves integrated into its double layered outer skin, this pro-level match soccer ball will retain its shape under the weight of ferociously struck shots. The classic white soccer ball is emblazoned with an eye-catching orange, grey and black pattern which will capture the attention of even the most lackadaisical linesman. Boasting unbeatable aero-dynamic performance, floated crosses and rifled volleys will sail through the air cleanly and truly. Offering MLS quality at a Little League price, the FORZA Pro is moving the goalposts when it comes to matchday soccer balls. The ultimate in professional standard soccer balls, your strikers will hit the back of the net time after time with this consistent and reliable matchday ball at their disposal. Available in three sizes, all ages and abilities can kick-off in style with a soccer ball that is befitting of the beautiful game. Our size 3 soccer ball caters to kids matches, the size 4 ball will kickstart junior 9-a-side matches while the size 5 is a regulation sized soccer ball for senior 11 x 11 matches. Choose form a pack of 1, 3, 12, 14 or 18 and get ready for professional matchday action.